The DynX dynamometer offers therapists advantages not previously available in old generation technologies, and in a format which allows these advantages to be easily realized. DynX electronic hand dynamometer offers therapists and their patients a precise, versatile, reliable and user-friendly professional instrument to perform Grip Test and Grip Therapy. Grip Therapy modalities include two scientific approaches for strengthening the hand-grip muscle group. Grip Therapy modes use microprocessor control to define an isometric training regimen appropriate for each patient and then evaluate patient compliance with the prescribed regimen without full time monitoring of the patient during each session. Three Grip Test modes to evaluate handgrip strength and endurance. DynX Grip Tests use microprocessor technology enabling precise measurements, collection of all data, instant review of that data following a series of measurements, an automatic calculation of statistical data, memory storage of all test data, and PC data download. 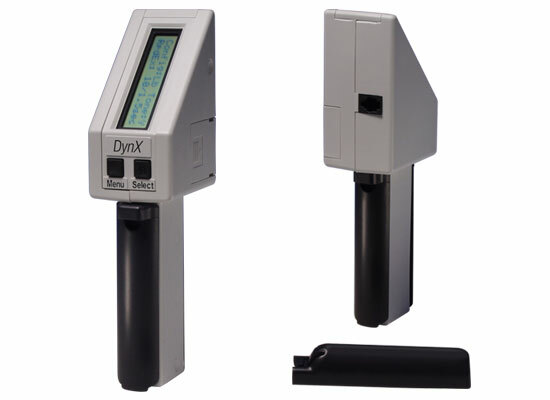 DynX precision is due to its solid state design which requires no re-calibration. Each DynX is delivered with a Certificate of Accuracy. DynX handle widths are the same as those commonly used in the hydraulic JAMAR dynamometer, making it possible to transition from old to new technologies without loss of consistency. Results of Norms tests conducted by the University of Florida Dept. of Occupational Therapy report excellent concordance between JAMAR and DynX measurements. DynX reliability exceeds 0.97 for test-retest exceeding those of the older hydraulic technology. Validity between JAMAR and DynX achieved 0.95. 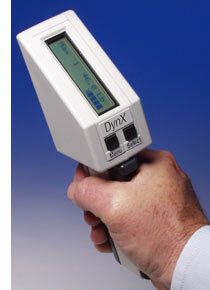 DynX instruments are designed for observation by either the patient or therapist, allowing for blind measurements. Configuration settings may be easily switched between English and Metric. Data and statistics are stored for each session in a built-in memory for later review and analysis. A data communications port located on the back of each DynX provides a means of downloading archived test or exercise data to a PC or for remote monitoring of real-time use. DynX products are light weight and very portable, enabling therapists to prescribe therapy to be done by patients at home, following training at the clinic. A training protocol can be locked into the device's memory for a patient, and compliance with the training can be evaluated by a therapist upon patient return to the clinic as a result of the device's data collection functions. Max Grip-Strength Test provides up to ten consecutive measurements of maximum grip strength in a series, each of which may be stored in a non-volatile memory as an acceptable measurement or may be over-written with a next measurement. Following each accepted measurement, a set of statistics relating to the series of measurements is automatically computed and displayed, including Average Strength, Standard Deviation, and Coefficient of Variation. All data stored in the device's memory may be downloaded to a PC for permanent storage. Endurance Grip-Strength Test enables measuring maximum grip strength (MVC, Maximum Voluntary Contraction), then selecting a % MVC (Max) as a target force to be held by a patient to evaluate the time this load can be maintained. The Endurance Test also measures the maximum force that can be maintained by a patient after it is impossible for them to maintain the target force as time progresses. The DynX stores time markers in seconds as the applied force drops each 10% increment below the target force. Force data is archived by time markers for review or download to a PC after the test. Rapid Exchange Strength Test provides a means of comparing a Right/Left Hand exchange spaced by 0.8 seconds or 1.5 seconds to measure instantaneous handgrip strengths in both hands, sequentially over a series of 10 or 20 exchanges. Following conclusion of this test, each of the strength measurements may be individually reviewed along with the statistics related to the series of measurements. Statistics provided include Average Strength, Standard Deviation and Coefficient of Variation of measurement series. Archived test data is retained in a non-volatile memory until it is over-written by new data. Archived Test Data is stored for ease of review during each DynX session. All grip strength measurements are automatically stored in a non-volatile memory to provide therapists, researchers and users the opportunity to conduct a series of tests, and then review results at conclusion of the tests. These data are stored until the DynX is used again in that test or therapy mode. After DynX is turned off intentionally, or after a 5-minute period has elapsed without use and it automatically turns off to save battery life, the archived data remains in the non-volatile memory for review when it is next turned on. All data stored in the device's memory may be downloaded to a PC for permanent storage. DynX memory holds 50+ sessions; when memory is full, older data is overwritten. Measuring MVC (Maximum Voluntary Contraction) during each therapy session is the key to scientific DynX training regimens! DynX training consists of a series of timed isometric Efforts performed by the hand grip muscle groups, at levels proportionate to Maximum Strength (MVC) measured for the muscles to be trained. These Efforts are interrupted with timed Rest Periods between each effort. The sustained isometric efforts of the DynX programs require only muscle tension. They are purely isometric regimens which have been proved safe and effective[5,1] Since there is no movement, tendons are only stressed and do not move in their sheath. No outward work is being done as a result of the lack of motion. DynX training requires much less energy than rhythmic training, does not generate large amounts of heat in the working muscles, and does not yield sweating. Compliance Scores are calculated during the therapy and are totaled during Rest Periods. Scores indicate the percent compliance with the prescribed Therapy thereby providing feedback to both the patient and the therapist on the quality of exercise accomplished. Two training regimens, called Fixed Therapy and Stepped Therapy, are provided by the DynX. Training compliance data is retained in non-volatile memory along with parameters of the training modality. These data may be downloaded to a PC for permanent storage prior to initiating another training session. Real-time output of training may be monitored at a PC during a session. Exercise training provided under Fixed Therapy provides a fixed level of Effort, during a fixed time period, repeated a set number of times in an exercise Session, each Effort spaced by a Rest Period of fixed duration. Effort levels are established as a percent of the Maximum Strength (MVC, Maximum Voluntary Contraction) measured in the handgrip muscle group to be strengthened. Therapists may adjust the Effort level from 10% of Maximum Strength, to 100% of Maximum Strength in 10% increments. Repetitions of the selected Effort level may be adjusted from 1 to 10. Duration of each Effort may be selected from 5 seconds to 120 seconds in 5 second increments. Rest Period between Efforts may be selected from 10 seconds to 120 seconds in 10 second increments. Nominated values for each of the parameters are provided in the DynX protocol as a default setting following Maximum Strength measurements. Also, following therapist election of a % Max Effort, the DynX program nominates the remaining parameters for Repetitions, Effort duration, and Rest Period times. Any or all of these nominated parameters may be adjusted to preferred settings by the therapist prior to initiating training. Exercise training provided under Stepped Therapy provides a stepped level of Effort, during a stepped time period appropriate to each of the Efforts, repeated a set number of times in an exercise Session, and spaced by a Rest Period between Efforts. Therapists establish the number of Steps (1-5) to be accomplished and the number of Repetitions (1-10) to be completed during an exercise Session. Effort levels are established as a percent of the Maximum Strength (MVC) measured in the handgrip muscle group to be strengthened. Therapists may adjust the Effort level in Steps from 20% of Maximum Strength (1st-step), to 100% (5th-step) of Maximum Strength in 20%MVC increments. Repetitions of the selected Effort level may be adjusted from 1 to 10. Duration of each hold Effort and the Rest Periods between Efforts are established by the DynX automatically. Each DynX is shipped with an Abbreviated User Guide, 9v batter, 2 Grip Extenders, and USB cable. Free software is available via download. The software searches for a connected and powered on Dynx. When it finds one, it downloads the archive from the DynX, and saves a file in "My Documents", titled "DynX_", with a filename that includes the serial number of the DynX, and also the date of the download. You can open this archive file with either Excel or any text based editor. Howden, R et al., The effects of isometric exercise training on resting blood pressure and orthostatic tolerance in humans, Exp Physiol 2002 Jul;87(4):507-515. Mathiowetz, V et al., Grip and pinch strength: normative data for adults, Arch Phys Med Rehabilitation 66:69-72, 1985. Wiley RL et al., Isometric exercise training lowers resting blood pressure, Med Sci Sports Exerc 1992;24(7):749-754. Asmussen E, Similarities and dissimilarities between static and dynamic exercise, Circ Res 1981;48(6):I3-I10. Wiley, et.al. Miami University, 2002 controlled study, unpublished.